Villa is a whimsical vacation rental, artfully embellished with gingerbread and light hues inside and out. This is a wonderful accommodation with great mountain decor. 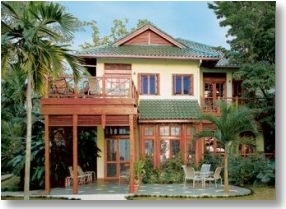 It is three bedrooms and a loft condominium with three bathrooms and a 4 star rating. The first bedroom has a king size bed, the second bedroom has a queen size bed and the loft space has bunk beds with a single bed on top and a double bed on the bottom and a single futon. There is also an additional rollaway bed for your convenience! It has a full kitchen, microwave, fire view wood burner, TVs, VCR, DVD player, stereo with a cassette and DVD player, free wireless internet access, iron and ironing board, hairdryers and a phone. This unit sleeps up to six people. 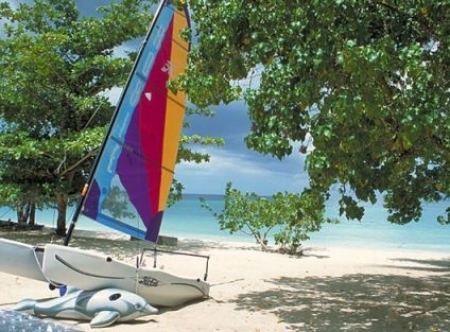 This vacation rental is strolling distance to public golf course, hiking paths and not too far from the stables for trek rides, the lake with marina for boat rentals, fishing and swimming too, property located inside Negril. If you have numerous families traveling to our area, or a large group doing an occasion or getaway, our vacation rentals are excellent for your needs. All rates are per night and exclude taxes. 4 night minimum stay. Contact us for holiday rates. Optional all-inclusive package includes unlimited food, beverages, fine wines & premium liquors. Add $115/adult/night. Maximum of 2 guests per bedroom. A surcharge of $75/night will be applied to guests exceeding 2 per bedroom. Children 5 and under stay free. Rates subject to change. A deposit is required to guarantee your rate. Cancellations are subject to a fee.